The Freedom From Religion Foundation is warning an Oklahoma City high school against its flagrantly unconstitutional use of a chaplain for its football team. A local resident reported to FFRF that Putnam City High School has designated the Rev. Mike Keahbone as team chaplain of its football team. Keahbone has been leading the team in prayers as part of the chaplaincy program and has explained that his goal — in coordination with his church — is to proselytize players. FFRF has sent a letter to Putnam City Schools informing Superintendent Fred Rhodes that public school football teams cannot appoint or employ a chaplain, seek out a spiritual leader for the team or agree to have a volunteer team chaplain, because public schools may not advance or promote religion. FFRF also notes that it is illegal for a public school or school-appointed volunteer to organize or lead prayers at public high school athletic events. FFRF highlights that public school endorsement of Christianity is particularly troubling, given that nearly half of young Americans are non-Christian, and 21 percent of those born after 1999 identify as either atheist or agnostic. 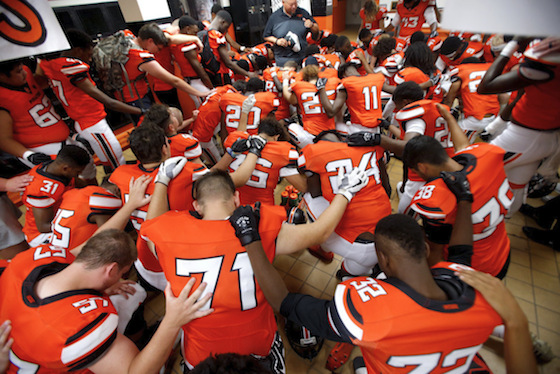 FFRF is asking that the district investigate into the complaint and take immediate action to stop coaches and other school representatives from organizing, leading or participating in prayers with student athletes at practices or games. The Freedom From Religion Foundation is a national nonprofit organization with over 32,000 members across the country, including in Oklahoma. Its purposes are to protect the constitutional principle of separation between state and church, and to educate the public on matters relating to nontheism.